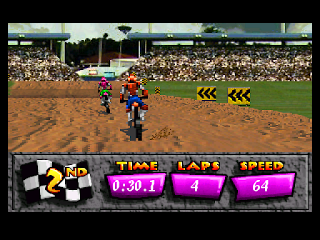 Motocross Championship is a racing game that was only released in Europe and North America. There are two modes on offer, the first of which is Practice and it allows you to race around any of the 12 tracks. There are different bikes you can select that include 125cc, 250cc or Super Bike and each has different speed and stability. Season mode consists of three rounds across all 12 tracks and the racers who finish in the top ten throughout gain money that eventually decides the winner. As soon as the action begins you'll immediately know you're in for a rough ride. Bikes seems to attract to each other like magnets and you'll always end up with a clump of riders jostling at 2MPH after only a few seconds in! Once you get going the controls are similar to Excitebike (1984, Famicom) as you can hold Down to gain more air off a ramp, and press Up to lean forward and get more speed. The game takes inspiration from Road Rash as well (1991, Mega Drive) as you can press C to punch and kick other riders. This function feels sluggish and most of the time your rider will lash out in the wrong direction! The frame-rate and animation is excruciatingly choppy and the grainy, heavily pixelated graphics don't help matters. The camera is also jerky and it's tricky to see the angle of your bike when trying to land off a ramp. Due to all of the above, you'll fall off your bike many times during a single race and 95% of the time you'll have no idea how it actually happened! The backgrounds are a mess and the grandstands look more like dumpsters. The music consists of cheesy faux rock that resembles dial-up Internet tones and the SFX are terrible. 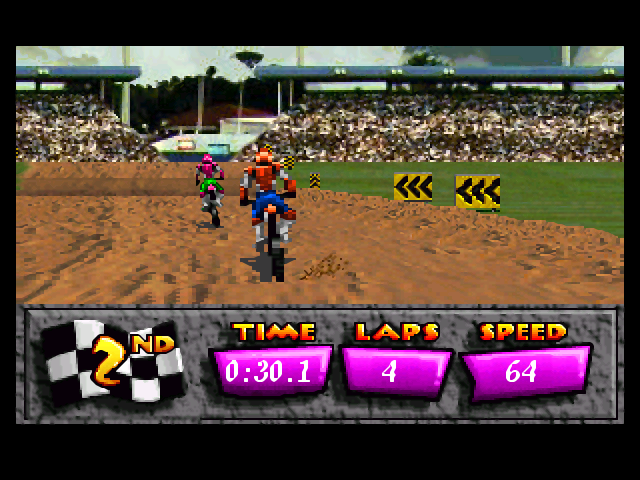 Motocross Championship does nothing to show off what the 32X is capable of and it could easily have been a 16-bit Mega Drive game. Everything from the presentation to the gameplay is sloppy and most of the time it's simply unplayable. Random trivia: Believe it or not, a total of 15 different prototypes have been found for this game! You can read about the differences here.